Timeless Imagination: Triumph of Good...!!! Today is Vijaydashmi. Also the Shubho Bijoya... and the 75 day festival that happens in Chandigarh culminates today. 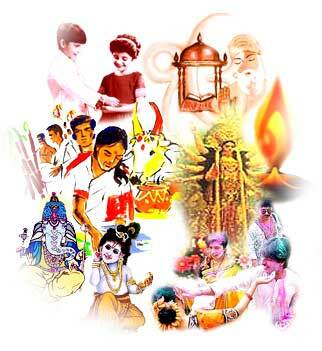 Apart from that the entire south India celebrates today's day as an auspicious occasion to start any sort of education. This is India. Where all colours come together to bind us into the spirit of festivities. Whatever te theme or the festival maybe... its celebrated with so much of enthusiasm that I get goose pimples all over my body...its such an experience....!!! Anyways, the whole lots of celebrations that mark today are embedded in the religious mytholigies and stories that have always taught us that bad may have the hay day but the good will always have the last laugh. I belong to the gen next... and though I have read Mahabharat and The Ramayana, sometimes when I actually ponder over em... it all seems fantasy stories from Alif Laila. Whenever someone is to describe a good man you say, he should have the qualities of Lord Ram. And evil man is associated with Ravan. But are these refrences of Good and Evil as relevant in today's times... or these festivals have just become a part of the boquets of celebrations and holidays that are given to us...?? Ram, I feel was GOD... too perfect to survive in the world that we live in. He was Mr Perfect... down to perfection. Where as Ravan, was human. And, to be really frank, all of us have bits and peices of him in us. He was materialistic... craved for power and he was better than us because, he worked really hard to get the kind of power that he possessed, where as we want everything served to us on the platter. Btw, As depicted Ravan did not have 10 heads, he had just ONE head, but because he was so intelligent and he was a complete Shiv Bhakt and did Bhakti to get the powers, his One head was equivalent to 10 heads. The thin line that differentiated Ram from Ravan was, the fact that Ravan misused the powers that he had acquired. And in that regard... dont we do the same...?? I mean that, the moment we are in the position of power... we misuse it...even if we do it... very lil....!!! So, basically we are just Humans... not Ram... and definately not Ravan. So wats the good that needs to be truimphed.... wat are the evils that need to be burned away?? Basically.... I feel... that we'll start embibing good, when we kill, corruption, hatered, start loving the people around us. Stop nurturing fights that kill people who are like us. If we start nurturing ourselves as humans who have love.... we'll truimph... the Evil. For all of us, who are Harry Potter fans, remember, what Dumbledore told Harry, when Harry realised that Voldemort and him share the same powers, Dumbledore told Harry, that Harry has something that Vodemort doesnt... and That is LOVE....!! !